Clear skin starts from clean skin; and having a good skin care routine is an important step in achieving clear and clean skin. A good skin care routine for acne skin doesn't require many products. A 3-4 step routine, consisting of *cleanser, toner [optional], moisturizer, spot treatment, for day and night is sufficient to treat acne. - Cleanser removes the grime collected on your face, preventing the grime from clogging your pores; thus, prevents existing pimples from getting worse and keep breakouts at bay. - Toner helps to clean off left over grime that has not been washed off by the cleanser. It also helps to restore the skin's natural pH level. - Moisturizer hydrates the skin. Each time you cleanse your face, it strips skin of its natural oils. So by applying a moisturizer helps to replenish the loss. Always remember that a well-hydrated skin helps to slow down the rate of oil production and keep skin problems away. - Zit zapper helps to soothe and speed up the healing process of a pimple, and a scar topical treatment helps to lighten post acne marks/scars. Check out my "5 Acne Spot Treatment Recommendations". Make sure you choose products that are made specially for acne skin/problems. These usually contain ingredient like salicylic acid, benzoyl peroxide or tea tree oil that fight acne and keep them at bay. Check out more information on the active acne ingredients: "Understanding The Acne Fighters — Salicylic Acid, Benzoyl Peroxide, Tea Tree oil". DO NOT mess with your natural sleeping schedule! Sleeping late or getting not enough sleep affects your hormone production and immune system, which can lead to an acne outbreak. You need to get 8 hours of sleep each night as your immune system requires energy to expel toxins built up in your body. Take note that your body "recharges" itself and dispels toxins, and your skin heals while you are asleep. So for the sake of a good and clear complexion, avoid being a night owl! Go to bed before 11pm everyday and get enough rest! Believe it or not, certain types of food may trigger acne! From my personal experience, I get breakout when I consume dairy products, seafoods (that are high in iodine: shellfish, shrimps, squids) or oily and spicy foods. These foods increase oil and hormone production, heat and toxic in the body, which can lead to breakout. You may want to stay away from these foods or cut down the intake. P.S: I recommend to observe your diet and monitor your skin (acne) condition. This way it can help you uncover if a certain food is constantly causing you to breakout. Water works wonders for your skin. It helps to cool you down, transport nutrients and expel waste products. To flush the toxic substances from your body and maintain your skin's beauty, drink at least 8 glasses of fluids a day. I have warned you readers many times not to pop your zits because if you do it in the wrong way, it may cause further damage to your skin, and may even lead to permanent scarring. But I know, it is hard to resist the temptation to pop them. So if you want to pop them, at least do it properly! Take action only if your pimple has come to a head at the tip. You can use a pimple extractor tool to pop the zit, but if you don't own one, you can use your fingertips (not fingernails). Before you start popping your pimple, make sure your face and hands are clean. Wrap both of your index fingers with clean tissues and gently apply pressure on the edges of the pimple. Note: Avoid popping the pimple using your fingernails as it can cause skin injury! Once the head and excess pus pop out, clean it off with a tissue. Stop the squeezing once you see blood! Next, paste a Nexcare Acne Patch over the open wound. ↑ This patch helps to absorb all the remaining pus embedded deep inside the pimple and prevents the pimple from reappearing. Replace a new patch when the patch turns white (covered with pus). Keep using the patch until there is no sign of pus residue on the patch — that means the pus has been fully cleared up. 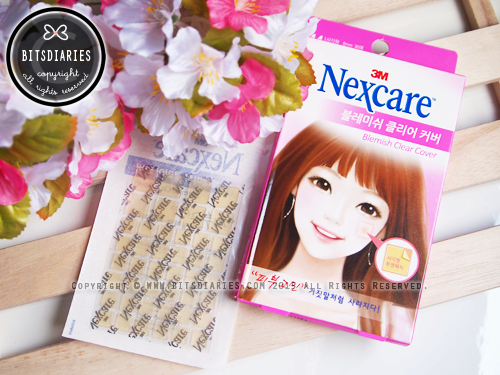 I highly recommend to use the Nexcare Acne Patch instead of continue to squeeze the zit using your fingers because the patch is less damaging to the skin, yet it does an excellent job in drawing out the pus and clearing pimple! P.S: Always make sure all the pus has come out, otherwise the zit might reappear. Any questions ask me at http://ask.fm/bitsdiaries. Shhh...I'm planning a live chat with you readers~ Stay tuned for that. - "The DOs and DON'T For Acne Prone Skin". 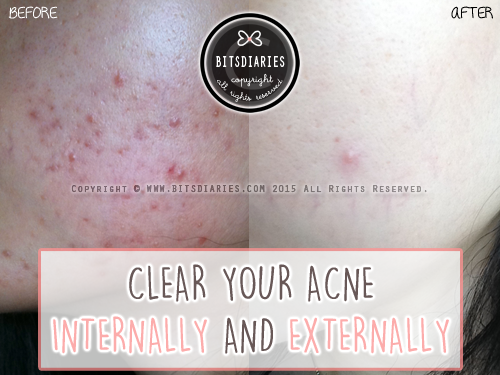 - "5 Common Acne Treatment Mistakes + The Solutions"
- "5 Suspects Causing You To Break Out"